It’s here! 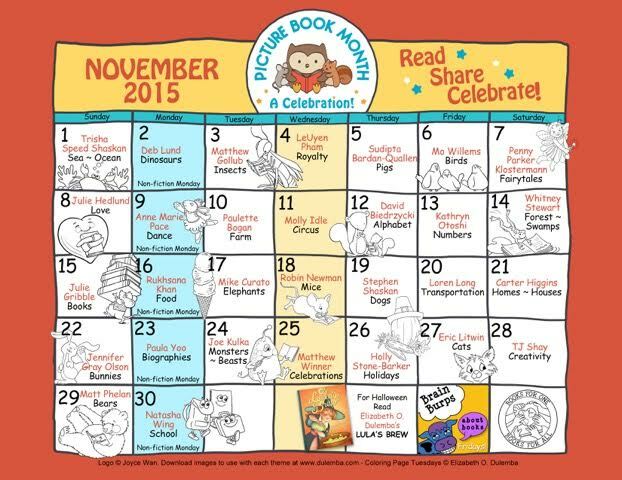 Around the world, schools, libraries, booksellers, and book lovers are coming together to celebrate the print picture book during the month of November. Now in its fifth year, the initiative is a viral phenomenon and was even featured on Oprah.com. Thousands joined the celebration creating Picture Book Month events across the United States as well as in Australia, Canada, Hungary, India, Jamaica, the Philippines, Singapore, South Africa, and the United Kingdom. Bloggers come together and write about their favorite picture books using the daily themes on the Picture Book Month Calendar created by Elizabeth O. Dulemba. A school in Budapest, Hungary read nearly 7,000 picture books during Picture Book Month! The website, PictureBookMonth.com, features essays from thought leaders in the children’s literature community. Each day in November, a new essay is posted. This year’s Picture Book Month Champions are: Sudipta Bardan-Quallen, David Biedrzycki, Paulette Bogan, Mike Curato, Matthew Gollub, Julie Gribble, Julie Hedlund, Carter Higgins, Molly Idle, Joe Kulka, Jennifer Gray Olson, Kathryn Otoshi, Anne Marie Pace, Rukhsana Khan, Robin Newman, Penny Parker Klostermann, Eric Litwin, Loren Long, Deb Lund, LeUyen Pham, Matt Phelan, Stephen Shaskan, Trisha Speed Shaskan, TJ Shay, Whitney Stewart, Holly Stone-Barker, Mo Willems, Natasha Wing, Matthew Winner, and Paula Yoo. Support for the initiative continues with partners such as the American Booksellers Association, the American Association of School, the Children’s Book Council, Reading is Fundamental, and the Society of Children’s Book Writers and Illustrators, The Eric Carle Museum of Picture Book Art, Friends of Tennessee Libraries as well as industry trade journals such as Hornbook and School Library Journal. A downloadable promotional kit is available as well as certificates, posters, and bookmarks created by Joyce Wan. Hear interviews with this year’s Picture Book Month Champions on Katie Davis’ Brain Burps About Books podcast. This year, Picture Book Month’s Education Consultant, Marcie Colleen, will be adding a “Literacy Activity” to each day’s post, based on the daily theme.